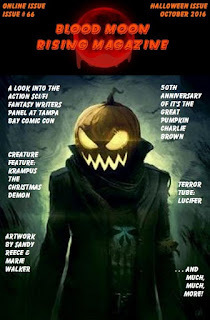 My favourite time of the year, Halloween of course, is almost upon us and I'm delighted to announce that my latest story, Spells and Persuasion is out now in the special Halloween edition of Blood Moon Rising Magazine. This is a great monthly horror magazine that is out each month and all content is free to enjoy. In this month's edition you'll find all the latest horror news, book reviews, as well as great features on real life spooky happenings and much much more. Spells and Persuasions is a short tale set in a land far away from here and tell the tale of a young serving girl, Katrina, who is desperately in love and yearns to be noticed by her heart's desire. When her natural charms fail her she turns to her friend Lucy for help who possesses arcane knowledge of witchcraft. Together they weave a spell to persuade her object of affection to love her back.